It’s about how some of our greatest scientific minds worked for a maximum of four hours a day and why that’s more effective than the insane (in my opinion) modern American notion that we should work 24/7. I know so many who work, work, work, even on weekends, as if it’s a badge of honor — or worse, something today’s jobs require. When I had a staff, I used to reprimand those who worked too long, too often, because I didn’t see anyone benefiting, including the company. Multiple research studies (including by those whose research led to the “10,000 hour” requirement for mastery, popularized by Malcolm Gladwell) support the diminishing returns of overdoing creative and intellectual work. “Even ambitious young students in one of the world’s best schools, preparing for an notoriously competitive ﬁeld, could handle only four hours of really focused, serious effort per day. The above link is to an excerpt — here’s the full-length version. A question about SEO (search engine optimization) on Quora stimulated me to write something I have had in my head for a while. Clients often ask this question. Search is essential and it’s complicated. Wouldn’t it be great if we could just bring in a hired gun? But search engine marketing is a strategy and like advertising, brand messaging, lead management, and everything else, it must be a considered part of your broader marketing strategy, serving the needs of your business. It’s not something you can just toss to a contractor. Worse, tackling SEO as a narrow tactic is a sure way to get bamboozled or possibly, penalized by Google. Sadly, the majority (seriously) of people who claim to be “SEOs” are either charlatans or incompetents. If someone tells you they will get you on page one of Google for x% of your 50 keywords, run. So, what do you do? The best answer is a mix of in-house expertise with some agency help. Step one is to understand search. Unfortunately, there’s a lot of dicey SEO knowledge out there, so be cautious about what you believe. I advise executives to read “The Truth About SEO” by Rebecca Lieb. It’s a few years old but largely about strategy that doesn’t vary that much and provides a broad understanding of search. For those tasked with executing the search strategy, read Lieb’s book and Moz.com’s Beginner’s Guides. Step two: Hire or designate your search marketing staff. Large companies that live and die on the success of search will need more staff and they will need to be pretty senior. 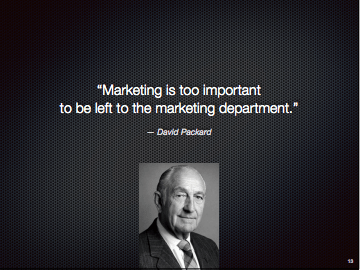 One idea is to hire a senior-level marketing consultant like me to build a strategy that mid-level people can execute. Why do you need someone inside? For a couple of reasons. First, no agency will understand your business as well as you do. And even if you have a great agency, you need someone inside to manage the relationship and make sure the agency is giving you its full attention. Finally — and this is really important — an insider has access to the rest of the company. Every search marketing program requires help from many people in the company, from product managers to executives, to IT and web staff. Outsiders can’t command resources or evangelize the cause. Step three: Consider hiring and managing an SEO contractor or agency. All that said, there are great SEOs and SEO agencies and they have expertise and stay current in a way most in-house marketing staffs cannot. But when you hire an agency, they must be managed and you must have in-house staff who understands search. Brand isn’t about logos and colors and an attractive home page. It’s about the instantaneous, gut reaction you want people to have when they think about you. If you are very, very skillful, or very, very lucky, your brand can command a core human value. Today, The New York Times is both. I would love to be on their marketing team right now. One can debate whether there is “no such thing as bad publicity,” but anyone who looks at marketing history knows that a fast, smart response is everything. The Times is responding with skill, using the President’s attention as an opportunity to grab a brand value that’s not usually available: Truth. There are values a company can’t claim without seeming phony. You can’t tell everyone you’re trustworthy or honest in so many words; similarly, claiming truth is a dangerous proposition — unless you’re lucky enough to be under attack by someone your constituents consider an enemy. The New York Times has claimed a high ground that will help it take a leadership position. In multiple media, the Times is investing in the banner of truth. It comes at a fortunate time. The company has had credibility and financial issues but the public’s memory is not very long, and the timing seems perfect. A strong, protracted statement — a branding campaign — is just what The Gray Lady needs. Obviously, there’s a sizable percentage of the population that won’t buy this. But they’re not in the newspaper’s potential audience anyway. For years, many of us have been wondering how newspapers will survive. People didn’t seem to see value in reporting and investigation, or even in writing. The Internet was drowning traditional news values. But some will survive and some will thrive. There are glimmers of hopes for the news business, with a few rising stars, like The Washington Post, The Wall Street Journal, and now, the “failing” New York Times. Mixing politics and business: Risky business? Just as politics is a risky topic at a party, most of us believe it’s dangerous to mix politics and business. But in these days of social media and online outrage, old rules are constantly up for question. You may not know Penzey’s, unless you’re a cook. They’re a popular online and retail spice merchant (Side note: I am a fan: Get spicy. Once you buy cinnamon online, you’ll never buy it in the grocery store again). Their social presence has always been personal, with heartfelt letters from their CEO, Bill Penzey but in election 2016, his letters turned from homey missives about baking pies for our loved ones to the storms outside the kitchen window. Mixing politics and business is a personal choice, not a business strategy, and it’s clearly not broadly applicable. But I take it as one example of where close relationships with customers change the rules. I’ve written before about empathy — it’s not just a modern buzzword — and I think the reason this worked in Penzey’s favor is that he was talking to his customers, heart to heart, over a cup of coffee and a slice of pie at the kitchen table. Whether we agree with his stand or not, it’s authentic. And it appears to have resonated. Please give us a moment to share something we hope you will find very valuable. Our customers come from all walks of life. The kindness of cooks knows no borders or divides. In the aftermath of the election, seeing the intentional damage inflicted on so many outside the white heterosexual male world, we raised our voice. We felt we had to. We did this because we are Penzeys. The Spice business is so intertwined with history that it’s not really possible to have one without the other. It became clear to us that we are now in a moment history will long have its eyes upon. For the sake of our customers, and for the sake of future generations, we felt the time had come to stand on the right side of history. And while the reasons for why we took a stand might be specific to our unique outlook, what we learned actually applies to all commerce in the United States. What we learned is that President-elect Donald Trump has no real support. Voters, sure, but no constituency. Running a campaign on “that horrible-terrible-woman who should be locked up,” while at the same time working to raise fear of minorities among white voters with limited access to education, clearly achieved its goal. But none of it left Americans with any sense of connection to the candidate they actually voted for. Willing to take a hit for what is right, we did what we did. In the two weeks since, online sales are up 59.9%, gift box sales up 135%. And we didn’t have a catalog arrive in this window this year, while last year we had 1.1 million! Yes, maybe for the moment we have lost 3% of our customers because of the so-called “right wing firestorm.” And, yes, they send emails of rage, and ALL CAPS, and bad language with the hope of creating the perception that they are bigger than they really are. But what we learned is that, in terms of retail spending, Donald Trump simply has no one supporting his views for America. He has no constituency. America’s Values, on the other hand, have a really sizable constituency, and that constituency moves quickly to support those that stand up for the values of America. If, as a company, you have values, now is the time to share them. You may well lose a chunk of your AM radio-listening customers, but if you really are honest and sincere, don’t be surprised to see your promotions suddenly, finally, find active engagement with the Millennial generation. And the time for this really is now. We understand all too well that, with the holidays, December is a tough month to get things done. We understand that a change in direction will not be easy, but you are where you are because you don’t need things to be easy. If you wait until after the wheels come off the track for the incoming administration, this moment will have passed. And while there’s no bad time to do the right thing, to do the right thing at the same time as others in your industry will work so much better than waiting until someone else has shown the way. In this moment there is finally the real chance to unite our nation in our shared rejection of sexism, homophobia, and racism. This is your chance to stand up for America’s values and make January a tent pole in your company’s history. Opportunities to do the right thing at the time when doing the right thing makes all the difference come once in a lifetime. Make your history proud. This advertising man makes us sound like dumb animals. I think he’s right. The first commercial ad I ever ran was about 30 years ago. I was working for Hewlett-Packard and was happy that I was working with teams of advertising and marketing professionals, people who knew how ads worked and would be able to guide me to proven marketing practices. Except that they didn’t, and they really couldn’t, because dammit, they didn’t know. Over the course of my marketing career, I have been party to millions of dollars of advertising. Sometimes we knew what worked. Often, not so much. 2) Most purchases are habitual. Human beings buy the same brand of toothpaste (or CRM software, or supply chain SaaS solutions, or anything else) over and over again not so much out of hard-won loyalty as pure sloth. 3) Decision-making has never happened in a “marketing funnel.” In most cases, it happens in something like a pinball machine. 5) Most of the time as consumers don’t know what we want, and when we do know what we want we don’t generally know why we wanted it. 8) Most of the effort expended on advertising is like primitive people doing a rain dance. There is a ludicrous emphasis on diagnosing what went wrong when it failed … and an equally ludicrous round of naive self-congratulation when it goes right. This might be the best article ever on public speaking. While explaining the “don’ts,” Jeff Haden (@jeff_haden) nicely tosses in a lot of “do’s.” He hits all my pet peeves plus a couple (numbers 6 and 8) I still do (gulp!). Want to ruin a presentation in seconds? Just drop in one of these sentences. In my presentation, What Startups Need to Know About Marketing, I list four things small companies often overlook in their marketing plans. Number one is “strategy.” As in, have one! Even if it’s just a couple of pages, a written strategy tells everyone in the company that marketing matters and we have a plan. Indeed, an understanding of the marketing strategy informs all decisions an employee makes on your behalf, from product design to logistics, to how we answer the phone. It’s a good read. 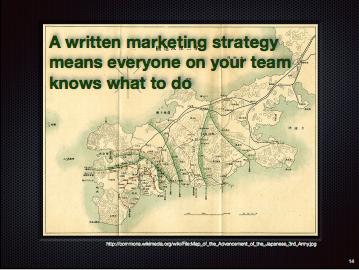 Even if your list of strategy elements differs from Greg’s or mine, the key is to have a strategy. You can improve it as you go, but please do start with something. It’s one of those things a small business owner never seems to have time to do but once it’s in place, it saves time and amplifies the efficiency and effectiveness of everyone in the company, every day. Are you running a startup? You already know dozens of marketing tactics, but are you doing the ones that matter? I gave this presentation, marketing for startups (PDF) to the Princeton Club of Northern California’s Entrepreneurs’ Group, with four marketing priorities entrepreneurs tend to overlook. 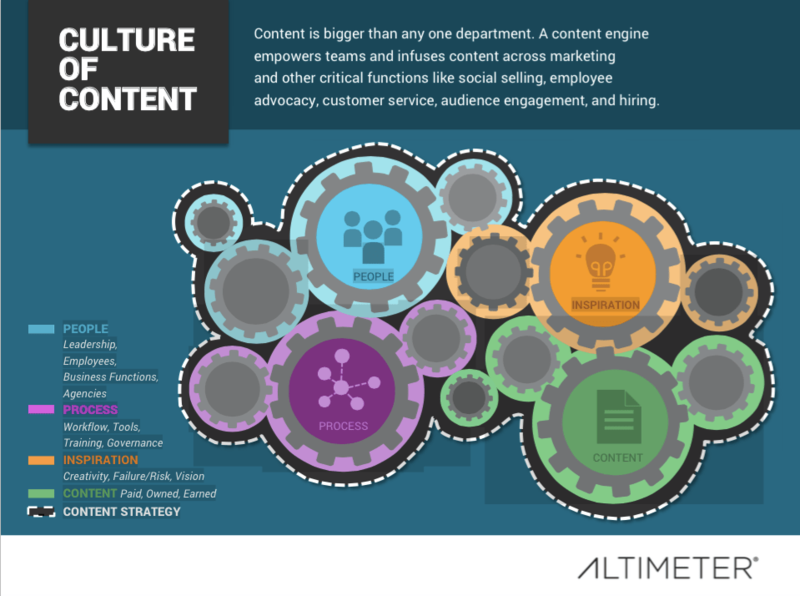 I was pleased to see that one of my favorite marketing analysts, Rebecca Lieb of Altimeter Group, has a new research report on how to build an organizational Culture of Content (with co-author Jessica Groopman and contributions from others). In any technically-driven company, content requires time from very technical, very precious technical resources. Unless the organization is committed, writing an article is seldom anyone’s highest priority. A technical article won’t happen unless everyone in the organization understands that content is valuable and the company acknowledges and rewards contributors. That’s what we did at Maxim and the results were fabulous, with quality material that measurably drove excellent search marketing results and customer satisfaction. 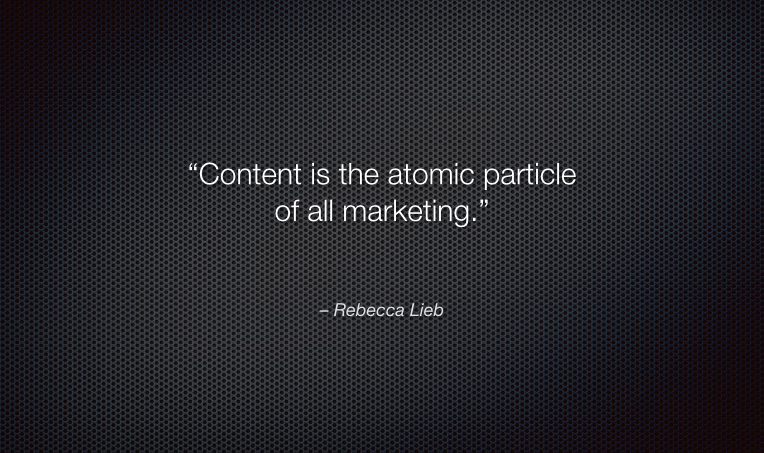 I gave a content marketing workshop to a client in September and have been thrilled to see how they are embracing it. They assigned someone as content lead. That’s good but what worked is that she’s not alone in the corner, pleading for content (which is what often happens); everyone is eagerly producing ideas and content. It is easy to predict they will succeed. At another client, it’s much more difficult. No one’s on board, no one’s committed, and writing is not a priority. Commitment is one element. Another is the content machine. “Think like a publisher” means not just producing content, but doing it with a plan, the way a magazine does. And once something is published, procedures and automation push out a stream of links, tweets, additional items, and additional media (see: Many Pieces of Content From One).